Digital technology is evolving rapidly, allowing businesses to continually explore and reinvent their organisations. While many technologies compete at the forefront, reality technology in the form of augmented reality (AR), mixed reality (MR), and virtual reality (VR) allows us to enhance the experience of our environments by letting us interact virtually with people and places to which we may not otherwise have access. The global VR/AR market is valued at USD 4.2 billion (0.1% of IT spend) in 2017, with VR at the vanguard. The VR market is relatively more mature than the AR market: the required software tools and hardware platforms to create immersive VR experiences are already available.Today, despite being at a relatively nascent stage, the reality technology industry has gained global attention from investors due to its considerable potential. 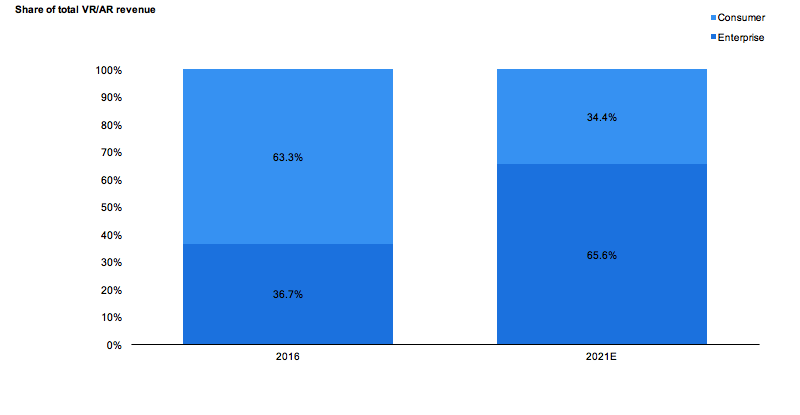 The global VR/AR market is projected to increase at an impressive CAGR of 70.5% over 2017–22E to approximately USD 61 billion in 2022E, with AR expected to overtake VR. This should be largely due to increased investments in AR owing to the advancement and higher applicability of AR with a larger focus from enterprises. While the USA should contribute significantly to this growth, the Asia-Pacific region is expected to grow the fastest. However, while China, the Asia-Pacific region’s largest VR/AR market, ranked as the second-largest global funding source (around 19% of global funding in 2017), it trailed the USA (58% of global funding). This was primarily due to the absence of large deals during the year, itself partly attributable to quality concerns surrounding technology in China. However, Chinese confidence seems to have recovered, with many long-term investments made over 2018Q1–Q3. Increased confidence could signal improvements in quality, which could also be attributed to increasing Asian investments in high-tech VR/AR companies outside of the region. Furthermore, China and other Asian players (e.g. Japan) lead in terms of affordability and high-tech developments in network infrastructure, which is likely to support growth. Hence, while at present the Asian market lags global peers such as the USA, it is likely to surpass them. This revolution should be led by a few emerging companies in the Asia-Pacific region, which could largely be based in emerging sectors such as manufacturing and healthcare. However, they might face challenges in the form of intellectual property concerns, consumer privacy, and data security concerns. Technology has advanced at a rapid pace, making possible today what had seemed impossible years ago. Virtual reality (VR), augmented reality (AR), and mixed reality (MR) are some of these advanced technological innovations that were science fiction a few years ago. 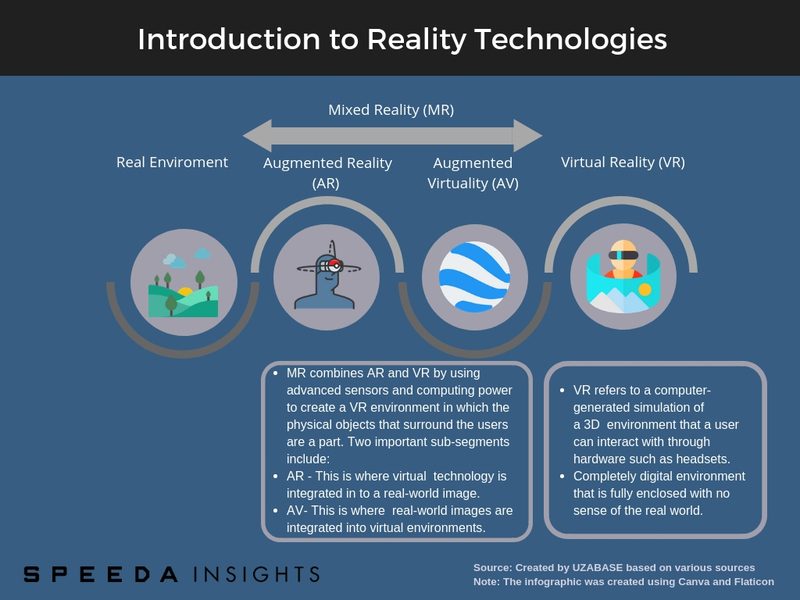 According to research firm Coresight Research, VR, AR, and MR together form part of reality technology, a term used to describe technology that stimulates or expands the users’ current environment. 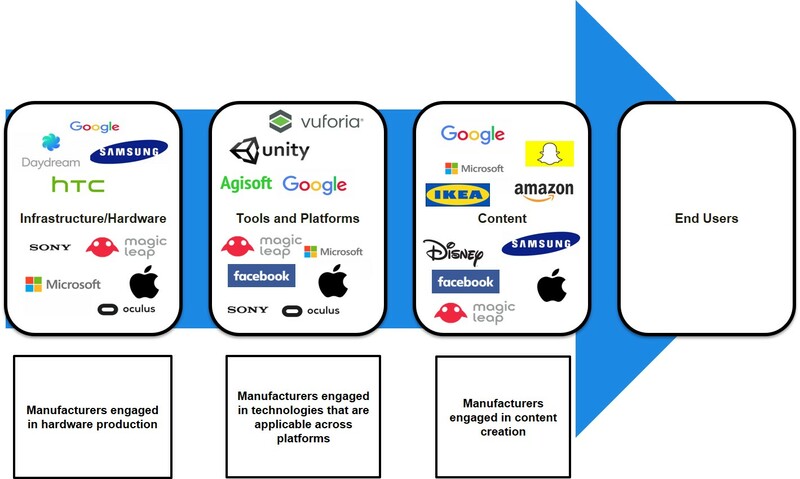 According to various industry sources, the global VR/AR landscape can be broken down into three main categories, namely: 1) infrastructure; 2) tools and platforms; and 3) content. The development and optimisation of all three segments creates value for the end-user. 3. Standalone HMDs (systems with independent computing power that can deliver VR/AR experiences without any external hardware) – examples include Microsoft HoloLens, Google Glass, and Magic Leap. ’Tools and platforms’ (also known as ‘tools and tech’) include content-creation tools, middleware, 3D conversion, and user interface plugins, among others. They also include technologies that are applicable across platforms (e.g. computer vision, streaming and compression), mostly delivered in software. Content includes actual content made for the immersion of a user in a virtual experience. They are often categorised into 1) games and entertainment and 2) enterprise/verticals. In terms of players, it can be observed that most global technology giants such as Google and Apple have already involved themselves across the value chain, despite the industry being relatively new. 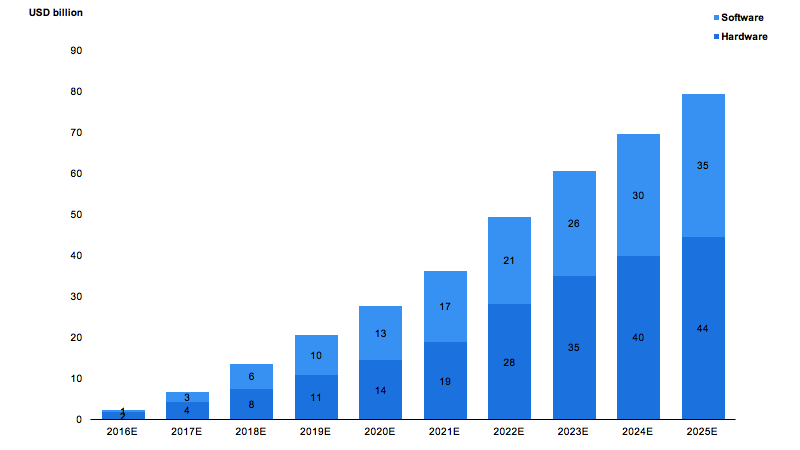 However, also as per ARtillry, global VR/AR revenue is projected to increase at an impressive CAGR of 70.5% over 2017–22E to approximately USD 61 billion in 2022E, with AR expected to overtake VR to account for an approximate share of 80% of global market revenue by 2021E. This should be largely due to increased investments in AR, owing to the advancement and higher applicability of AR, with a larger focus from enterprises. 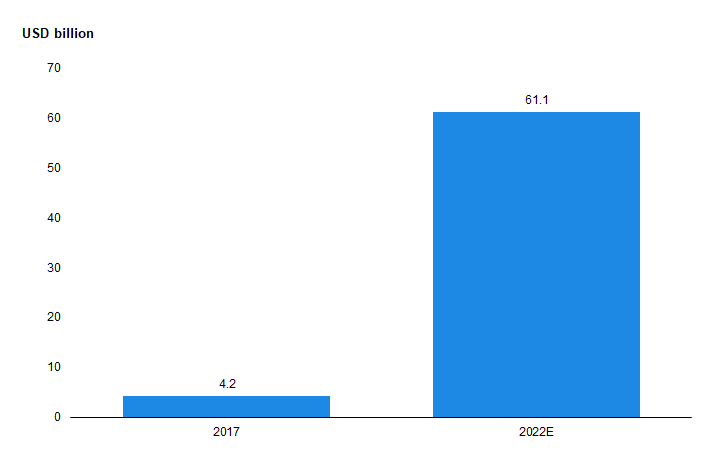 In turn, as per ARtillry, enterprise VR/AR is expected to dominate global VR/AR revenue, with a share of 65.6% by 2021E. Today, AR has been identified as a tool that could have significant use in real-world scenarios. For instance, AR is already used to deliver real-time information to support diagnosis, surgery, and treatment plans. This was seen at the introduction of AccuVein — a handheld device that can scan the vein network of a patient; the technology reduces escalations in approximately 45% of interventions. Furthermore, using AR diagnostic tools, surgeons can plan procedures before making the first cut, make models of tumours, and model disease conditions for further study. AR can also be used for home remodelling. For example, the Ikea Place App, which was built on Apple’s ARKit technology, helps customers scan their rooms and virtually place Ikea objects in the rooms to design a new environment with new products; the app helps customers make informed choices before buying new furniture. As AR matures, its higher applicability should translate into increasingly useful innovations. As per Virtual Reality Venture Capital Alliance (VRVCA; a membership of 49 of the top VR investors globally), global VR/AR funding grew at a strong CAGR of 88.7% over 2013–17 to USD 3.8 billion in 2017, with the value increasing nearly 3x over 2015–17. Furthermore, the number of global deals rose 11x over the same period to 475 deals in 2017, with the deal count doubling over 2015–17. Growth in funding over 2015–17 (latest period available for breakdown) was driven largely by Series B funding (cumulative contribution to growth: 47.3%), although it accounted for only 6.9% of global deals over the period. This was despite a focus among many investors on early-stage deals (seed/angel and Series A funding accounted for 85.1% of total deals). 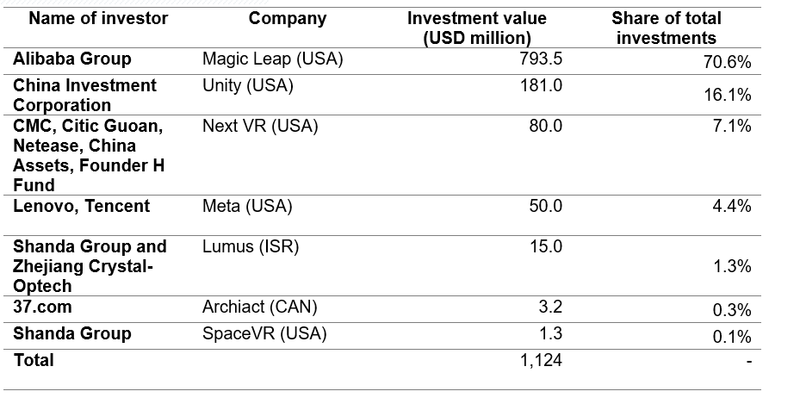 Furthermore, others (beyond Series C) contributed 44.2% of total growth in funding over the period, despite a minor deal share (6.2%) owing to larger value deals such as Magic Leap and Niantic. Note 1: Angel – An angel round is typically a small round designed to get a new company off the ground. Investors in an angel round include individual angel investors, angel investor groups, friends, and family. Note 2: Seed – Seed rounds are among the first rounds of funding a company will receive, generally while the company is young and working to gain traction. 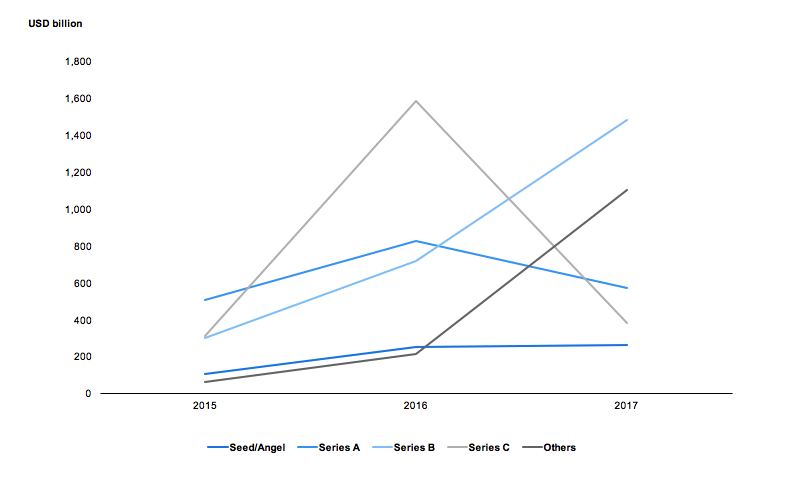 A seed round typically comes after an angel round (if applicable) and before a company’s Series A round. 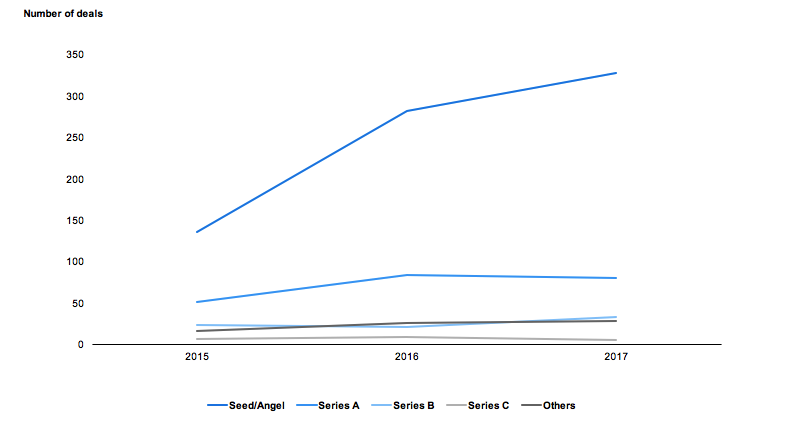 Note 3: Series A and Series B rounds are funding rounds for earlier stage companies. Note 4: Series C rounds and onwards are for later stage and more established companies. 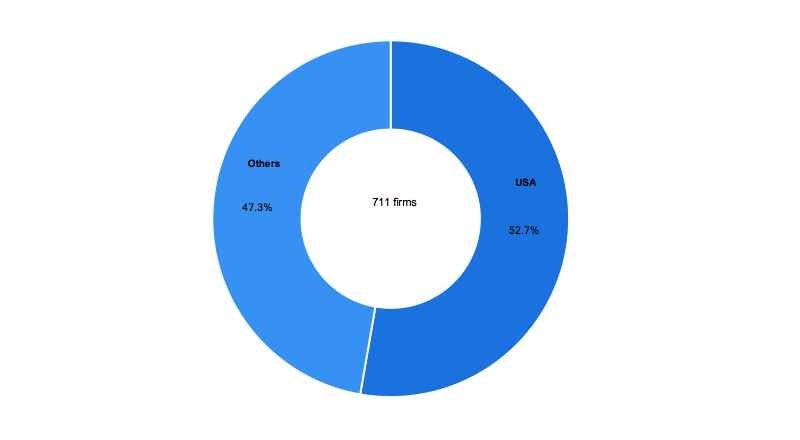 According to technology research firm Venture Scanner, the USA ranked as the top country for VR firms, recording a total number of 375 firms as of July 2017, accounting for 52.7% of global VR firms tracked. Furthermore, the USA filed a total of 10,295 patent applications for VR over 1994–2017, accounting for 27.4% of global VR patents. This was followed closely by China (21.7%). The Asia-Pacific region contributed 18.4% of funding growth in total over the period, led by China. Despite accounting for approximately 25% of global deals in 2017, China ranked as the second-largest source of VR/AR funding, contributing approximately 19% of total global funding in 2017 (versus 23% in 2016). China trailed the USA, which accounted for approximately 44% of global deals in 2017, with a total funding share of approximately 58% for the same year. In addition to lower deals, China also lacked large deal values; this can be attributed partly to the lower maturity of the country’s technology compared with global peers’. However, as per Digi Capital, Chinese confidence seems to have recovered, with many long-term investments made over 2018Q1–Q3. Increased confidence could signal improvements being made in quality, which could also be attributed to increasing Asian investments in high-tech VR/AR companies outside of the region. Furthermore, China is recognised as a key region for VR/AR, as per the VRVCA, owing to its unique investment opportunities. For instance, the country hosts nearly 5,000 VR arcades, cinemas, and experience centres — nearly 10x the USA’s. Hence, as China’s technology matures, it is likely to be a strong competitor for the USA as returns from current investments materialise over time. Apart from large-scale investments, our analysis also identified two other key factors that have supported VR/AR development in the Asian market (the following list is not exhaustive). 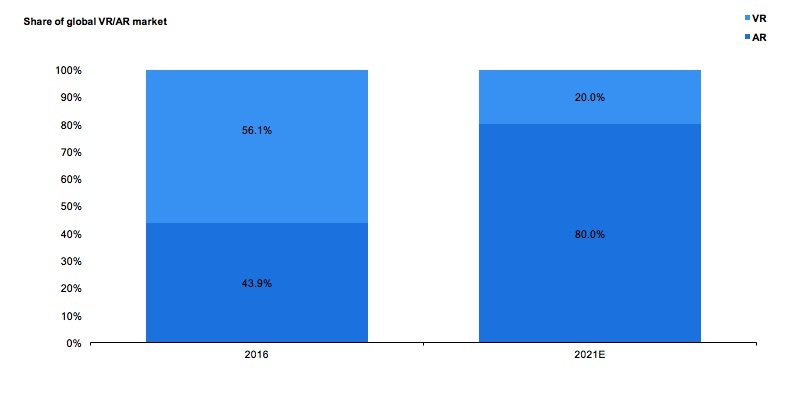 In terms of hardware platforms, as per market research firm CCS Insights, global VR/AR device shipments are expected to grow at a CAGR of 55.4% over 2017E–22E to 97.3 million units in 2022E, with smartphone HMDs (screenless) leading the market (contribution to growth: 69.5%; CAGR: 49.5%) over the same period. However, other devices such as tethered HMDs and standalone HMDs are expected to grow faster owing to their greater functionality. Nevertheless, today, smartphone HMDs are relatively more affordable than other types of devices. As per Morgan Stanley Research, as of September 2017, the average incremental costs of owning a wired VR device was approximately USD 1,000, which was nearly 7x the incremental cost of owning a mobile VR device. Mobile VR/AR tends to be less expensive because of its minimal requirement of hardware. However, the level of virtualisation is far lower compared with that of wired devices. As per market intelligence firm Newszoo, global smartphone users are expected to increase at a CAGR of 11.6% over 2015–20E to 3.6 billion users in 2020E (46.2% of the global population in 2020E versus 27.1% in 2015), supported largely by increasing affordability and improved data plans. 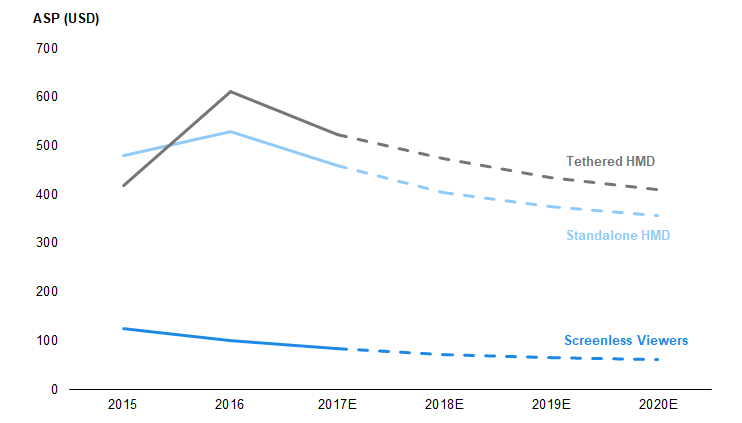 Furthermore, as per Statista, the average selling price (ASP) of VR screenless viewers is expected to decline at a CARC of 11.5% over 2016–20E to approximately USD 62 in 2020E, much lower than the ASP of VR tethered devices (CARC of 9.4% to USD 411 in 2020E) and VR standalone HMDs (CARC of 9.4% to USD 357 in 2020E). 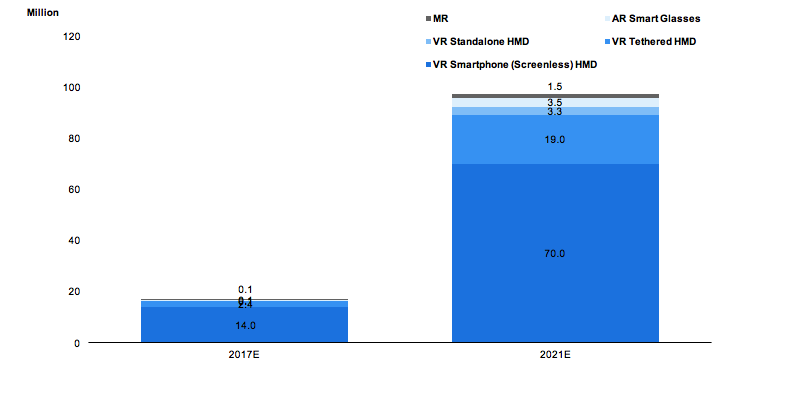 This implies that despite a potential increase in the usage of standalone and tethered VR/AR devices with higher virtualisation among mid- to high-end users, low-end consumers are likely to continue to find screenless VR/AR more affordable, unless the prices of other devices register steeper declines. In fact, the prices of many VR devices have been declining owing to strong competition between manufacturers and increasing production with cheaper raw materials. However, Asian countries such as China have produced VR/AR devices at costs much lower than their global peers’. For example, BoboVR Z3, a Chinese mobile VR HMD, priced at approximately USD 18 as of 2017, was nearly 6x cheaper than Samsung Gear VR (USD 99). Similarly, VR Shinecon was priced at approximately USD 23 the same year, nearly 9x cheaper than LG 360 VR (USD 199). 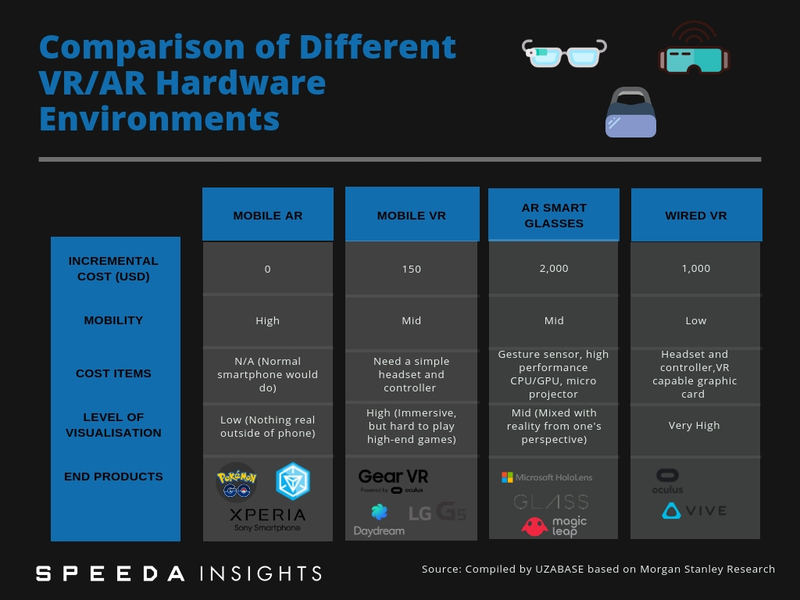 However, Chinese VR/AR devices are known for a lack of quality, and this puts the market at a disadvantage, unless significant effort is put into addressing the quality of devices. 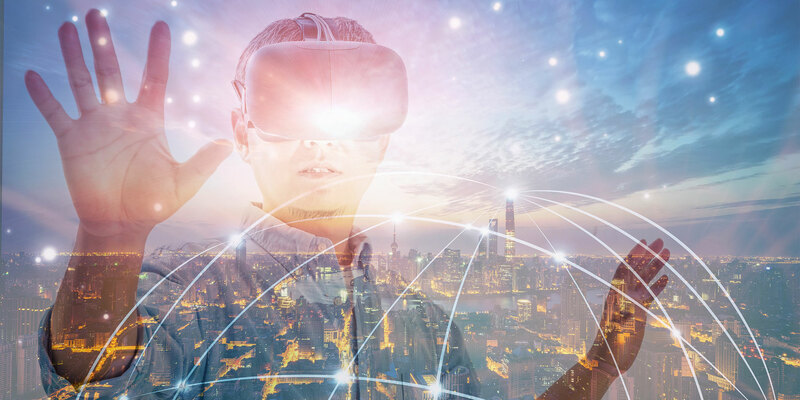 In spite of the recent adoption of VR/AR, the market faces some challenges in terms of infrastructure and connectivity. In fact, most virtual experiences require considerable bandwidth for premium content experiences; coupled with all-day device usage, this leads to unprecedented network strain, which current network infrastructure cannot fully support. The introduction of 5G and its continued development is likely to allow AR and VR to reach its full potential. As opposed to 4G networks, 5G helps reduce latency (delay), introduce more capacity, and provide for a more uniform experience. Based on the International Telecommunication Union’s (ITU’s) standards for International Mobile Telecommunications (IMT), 5G aims to deliver speeds of around 20 gigabytes per second (Gbps), approximately 20x faster than 4G (0.01–1.00 Gbps) and capable of supporting advanced VR/AR applications. Furthermore, the ITU also notes that 5G latency could be as low as 1–4 milliseconds (10–98 for 4G). 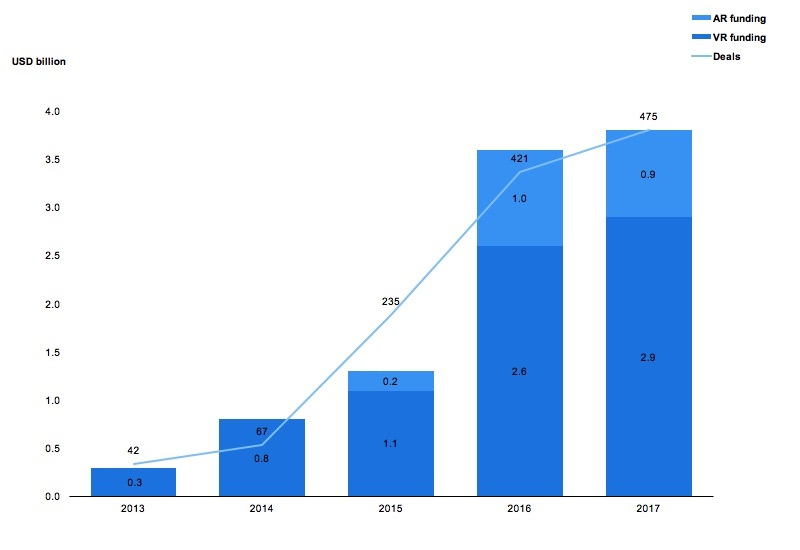 As per the Global System for Mobile Communications (GSMA; a trade body that represents mobile operators’ interests), global 5G connections are expected to reach 1.2 billion by 2025E and to account for approximately 14% of total mobile connections. 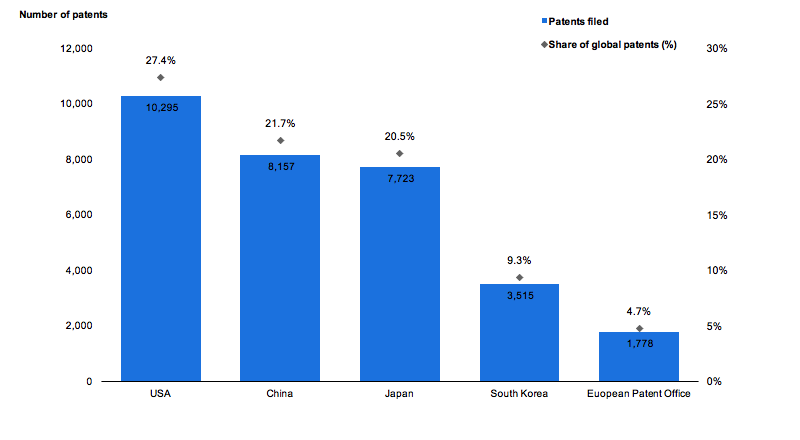 China is projected to lead global 5G connections with a 32.2% share of global connections, followed by the USA (15.7%) and Japan (7.2%). However, the initial deployment of connections is expected to take off in South Korea in 2019, making it the first country to do so. As of today, VR/AR is one of the most widely discussed concepts in today’s global technology circles. In fact, VR/AR shows potential to make a significant change in the way we work, experience entertainment, or even make purchases and participate in social activities. 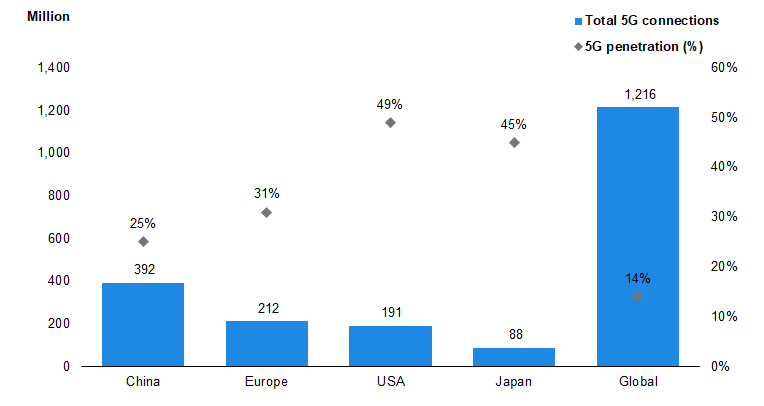 While at present Asia lags behind North America in terms of VR/AR adoption and market revenue, our analysis concludes that the Asian market shows considerable growth potential for VR/AR adoption, with countries such as China and Japan likely to take the lead. In terms of areas of global investment, the largest deals seen over 2015–17 were in enterprise services/vertical applications (36.5% of global deals over the period), followed by tools and tech (21.3%), according to VRVCA. However, despite accounting for 14.2% of global deals across 2015–17, hardware led global funding, accounting for a share of 41.2%, followed by tools and tech (27.7%). In contrast, gaming and entertainment accounted for 21.0% of global deals during the same period, while accounting for only 17.9% of global funding. As per the same source, higher funding in categories other than gaming and entertainment is often due to investors’ increased focus on tools and technologies that can be applied across various content and platforms and enterprise services that have faster product-market-fit validation and monetisation cycles. This implies growing interest in areas outside of the consumer market. 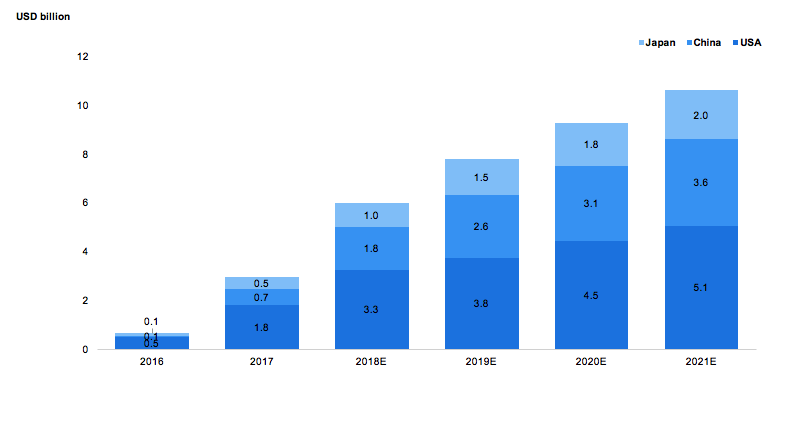 In turn, as per ARtillry, Enterprise VR/AR is expected to dominate global VR/AR revenue, with a share of 65.6% by 2021E, implying that investments in hardware, tools, and technology are likely to absorbed more by the enterprise market. This in turn could imply that Asian companies, which are often known for quality concerns, could potentially see increasing investment deals in other verticals apart from gaming, if they focus on quality in terms of content and devices. In China, for example, investors are keen to invest in overseas VR companies that have advanced VR technologies that could help Chinese enterprises improve their technological know-how and thereby explore expansion opportunities abroad. However, the Asian market is relatively fragmented, with various VR/AR manufacturers offering too many different brands in the market, each with a different proposition. While this may bode well for the industry as a whole, as different VR/AR devices and content can be applied to different verticals, it would also make it difficult for any VR/AR technologies to be applicable across the entire industry as a whole. However, new VR/AR companies are likely to face risks in terms of 1) consumer privacy and data security; 2) intellectual property infringement; 3) compliance with platform requirements in publishing content; and 4) product liability and health issues.